A carpet has become an indispensible accessory to the overall ambiance of a room. Be it office or home, a carpeted floor has become the preferred choice of decor. In the office it adds to the professional look. Back at home it adds to the warmth and comfort. That’s why it has become necessary to maintain your carpet. Despite your best efforts, your carpet is bound to get soiled. Be it from drops or spills or even from whatever is on the bottom of your shoes, you carpet cannot escape from getting dirty. In order to keep up the beauty, comfort and durability of your carpet, you have to clean it up from time to time. Here we discuss how to do just that. 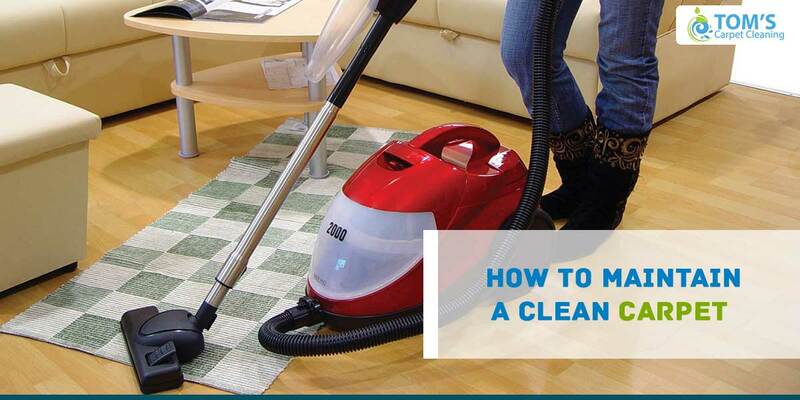 Regular Vacuum – this is the best way to take care. If your carpet is a delicate loop one then it is advised to vacuüm it only with suction. On the other hand pile carpets can be cleaned by using a heavier cleaning method by using a beater bar. In case of natural wool, it has a tendency to keep dust on the surface; it’s easy to clean by vacuuming. Immediate Stain treatment – never rub a stain; it can wear at the fabric helping the stain to set in. Always blot spills by using a white paper towel. Blotting puts a small amount of pressure on the stain to soak it up. Always blot from the outside of the stain inward. Blotting outward can spread the stain. Do not use a coloured one; you may compound the problem by transferring dye. First you continue blotting the area until it is completely dry, and then vacuüm it. You can even try club soda or stain removers while cleaning the stains. Powder or Shampoo as carpet cleaner – this is another great way to clean your carpet. Spread the powder over the carpet liberally. Leave it for at least 30 minutes. If you can leave it overnight , all the better. Then simply vacuüm up the powder. You can also use carpet shampoo, making a solution by diluting it with water. But remember to not make the carpet too wet, as it will increase the drying time. Then use a hard bristled brush to scrub the carpet. Finally vacuüm it after it has been left to dry. Powdered carpet cleaners are quicker to use and can be vacuumed up easily. Oils – oil stains can be removed using alcohol on the soiled area. Repeat if the stain is deep. Rust – put lemon juice of rust stains and sprinkle some tartar cream. Leave it for some time and then blot the area using a white towel. Never scrub. Dry it with a towel. Pet-urine – mix white vinegar with warm water and spray it over the area. Then blot the area. There are other kinds of stains and all can be removed if you keep a keen eye on your carpet. Keep it clean for health and beauty.